The predicted winds were there as we started out in the morning, full sails flying. Soon the wind started picking up and we began to reef the sails in. Each time we reefed the sails the wind would pick up a hair more and we would pull in a little more sail. Before long we had completely rolled up the jib in front, our mainsail was a fraction of its full size, and we were still moving along at 7-8 knots. The wind was blowing 26-28 knots. We are learning how to deal with the stronger winds, how to anticipate what the boat will do, and how to make the ride more comfortable (and safe), while still making headway to our destination. Having confidence in the boat, and confidence in each other makes the whole experience calmer and more enjoyable. We picked the day in green to go. Quite a few squalls passed through and as we neared St. Kitts we were watching the island dissappear behind the falling rain in the distance. We were waiting and watching , trying to estimate how long it would be before we got soaked. All of a sudden the wind died, and the waves flattened out. It was as if we were in the eye of a storm. The ocean looked like a lake and the wind was dead calm. We were inching forward at 1-2 knots. This was probably only due to our previous momentum. The stillness only lasted about 5 minutes, but it was certainly a contrast to the squalls that we had been going through. St. Kitts. Brimstone Hill Fortress is at the top of the near hill . We turned the corner of the island and headed down the long lee side of St. Kitts. We could see many brick smoke stacks, remainders of former sugar refineries. 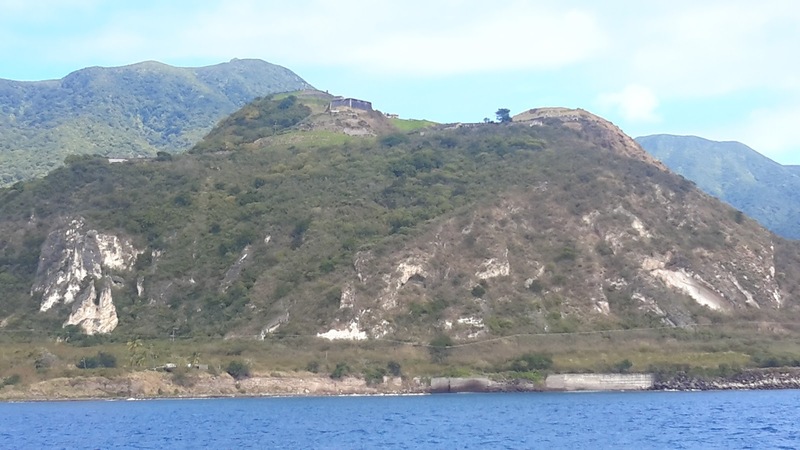 We went past the large Brimstone Hill Fortress, situated on the side of the mountain, built by slave labor beginning in 1690, it sits imposingly perched above the ocean. Deep Water Harbor is to the right of the picture, Customs is to the left. 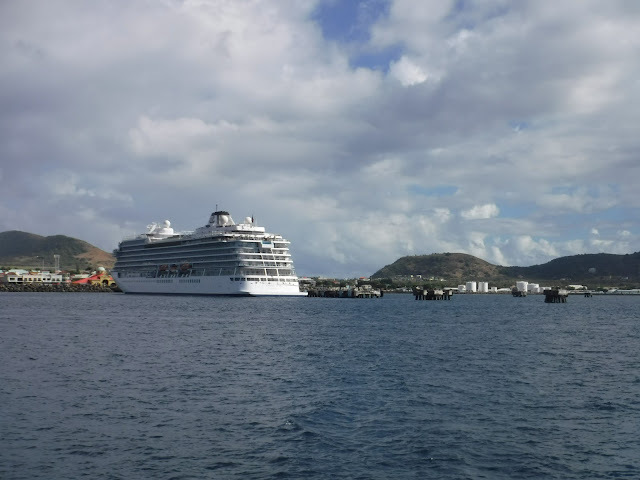 Arriving in port, the anchorage closest to customs appeared very rolly so we headed past the three cruise ships in harbor to a calmer anchorage. We are now in Deep Water Harbor, very industrial, but quite calm. We will check in to St. Kitts tomorrow.